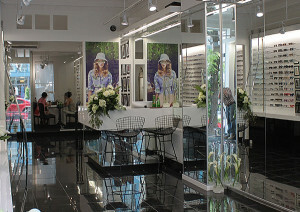 The latest Cutler and Gross store is located in a signature Queen West building, beside the Trinity Bellwoods Park. Following the brand’s characteristic design, the minimalist aesthetic of the interior allows the main focus to be the vast selection of the frames available. The main room is designed to flow as a continuous display with mirrored columns to emphasise the continuity of the collections, taking advantage of Toronto’s Queen West early 1900s architecture with long and narrow lots.